Twitter has been flooded over with the humorous tweets and trolls on ongoing Tamil Nadu’s politics. Various opinions on Sasikala and Panneerselvam has come to limelight, now after Sasikala is jailed, Eppadi Palsamy has become the topic of the town. Right now, the TN assembly hangs in the balance as the MLAs go for a floor test to decide whether OPS or Palanisamy would be elected as the next CM. Despite the trolls from netizens and common twitter users, no celebrity ever uttered a word that triggers any jokes or trolls on Tamil Nadu. Meanwhile, the former cricketer and current commentator Sanjay Manjerkar now tested his nose in the state politics by tweeting something that annoys Tamilians. Tamilians didn’t leave a stone unturned to troll him blue and black. 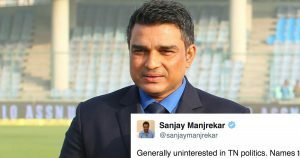 Contrary to his well-received commentary in International cricket, people didn’t accept this statement for granted, the furious netizens criticised Sanjay for his biased tweet. @cricketaakash what a stupid answer that, havent u learnt to/ bound to learn, pronounce SouthAfrican/lankan players names? we have heard your commentary, humble request dont even try.